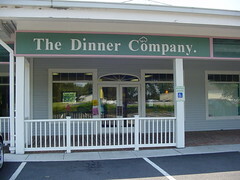 The Dinner Company pictured below is where we prepare our dinner meals each month. I was supposed to join my friend in a scrapbooking challenge where we had to chose something we do routinely or do often and then do a scrapbook page about it. Immediately, I chose our monthly Dinner Company visit. I planned to take some pictures the next time we went and forgot, so the following month, I remembered to take the pictures. Then, these past 2 months I have been trying to sit down and do a page or two, but it just keeps dropping off my priority list. I started to feel bad a couple weeks ago since I think this all started in May, so I decided to post the pictures here and in the next month or two, I will do the pages and then post them here too. The two females, Jayme and Pam, that own and run The Dinner Company are awesome. They work so hard to get customers, keep the food containers filled when customers are preparing food, and keep everything organized. This summer was a struggle for them to stay open with the slowing of the economy. This fall they are hoping things will pick up speed and more customers will come. They really have a great business going. They have facilities in Salisbury, MD, Ocean City, MD and Westminster, MD. They have a great facility too with a nice reception area for arrivals and a waiting area that generally doesn’t have to be used since you don’t really have to ever have to wait. They have a bistro table and chairs, couch and they did have chairs that are now mine. We love to be able to take food on our travels and recently, we wanted to add a trail mix but not just out of a box, so I did some research. I found out what goes into a good trail mix, I modified it like I always do, and then put one together. We love it so much that we take it everywhere now. Note: All ingredients are listed in grams, ounces, and measuring device depending on how specific you want to be and what your scale reads. If you want something more exact with a closer repeatability, use the grams/oz measurements. If you want something a little bit more random or want to put it together really fast, use the Tbsp/cup measurements. Store in an air tight container and enjoy. We store the bulk of it in a large air tight container and then put small 30 g servings in small air tight containers that we can take to work or throw in our bags when we have to run out the door quickly. It gives a whole new meaning to fast food. If there are any allergies, remove those foods and either add more of something already in the recipe or something else. 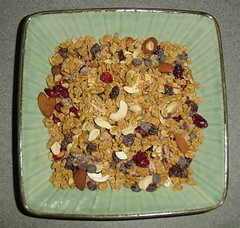 The trick is to keep a preferred ratio of granola to the additional ingredients. If you like it more on the granola side, then add more of it and if you don’t, then add less. Trail mix is so easy to make and it relatively good for you in small quantities when not exercising; and, it is a great energy food when hiking or such. Just remember to write down what you do end up making so you can make it the same way or know what to increase or decrease next time. Just remember, trail mix is supposed to be an energy food not junk food. 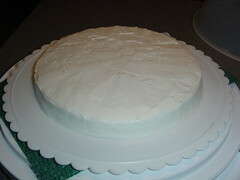 I tried something new this week – Sept 23rd – for the cake class. The cake consists of the same type of cake as last week, however, I made a chocolate icing rather than the white icing like last week. I wanted to decorate it more, but we ran out of time in class. 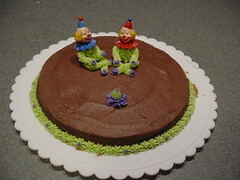 At first I was thinking Zen clowns but Carla suggested that they looked like they were around a campfire – I can definitely see both! 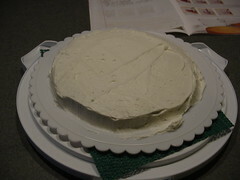 We did what I expected with the cake last week, we scraped the icing off the cake and then ate the cake – the icing was made with vegetable shortening (Crisco) that Matt nor I really wanted to eat. So, I thought that I would make something I knew we would eat. I looked at the canned icing and it too is made with vegetable shortening and has transfats in it – that wasn’t an option. So, I turned to the organic/natural aisle at Giant for a solution. I found an icing mix made by the same company as the cake was made by – Cherrybrook Kitchen – and they had chocolate and vanilla. 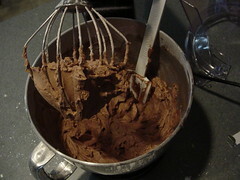 I bought the all natural Chocolate Frosting Mix that is gluten-free, dairy-free, egg-free, and nut-free. 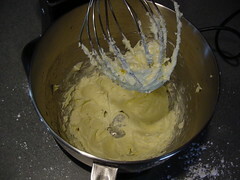 Instead of using the 2 1/2 sticks of margarine they suggested, I used 2 1/2 sticks of organic butter which no longer made it dairy-free, but made it taste awesome and I didn’t have to use anything artificial. With the icing made of butter it has to stay in the fridge otherwise, well, the icing gets soft and will go bad. 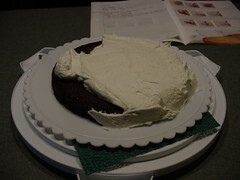 And this week, we are actually eating the cake with the icing since it is chocolate and really good. 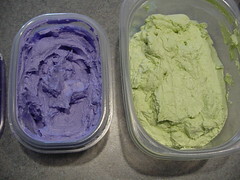 I still had to make the Crisco icing for the decorating portion of the cake and I chose purple and green for my colors this week. 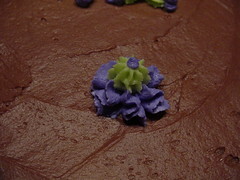 I think I might try the butter icing next week for the decorating portion – maybe I will make both and try them each out – just in case. 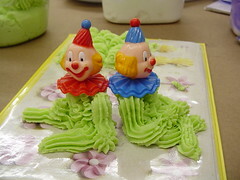 For decorating, we had to use clown heads and learned to build their bodies with icing. 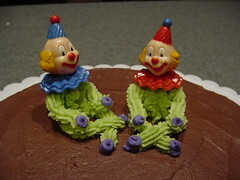 I am not that crazy about clowns, but everyone’s clowns did turn out pretty cute and not scary. 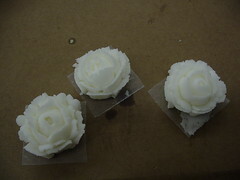 We also learned how to do roses, various flowers, and a trim style that looks like shells. Next week will be our last week. It has been fun so far. 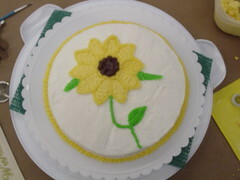 Our 2nd cake class day was September 16th. 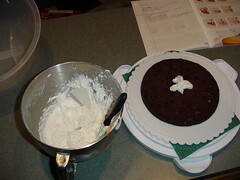 Our objectives were: (1) to make any type of cake we wanted, then (2) make a batch of cake icing and ice the cake, then (3) make a batch of stiff icing that 1/3 would be used to practice techniques with and the other 2/3 would become medium icing and be decoration for the cake, and then (4) bring it all into class where we would work on the sunflower pattern along with other techniques. 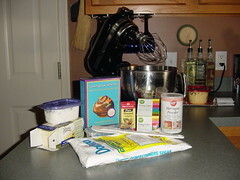 I figured if I was going to learn all I could, I might as well do some experimenting with the cake too. 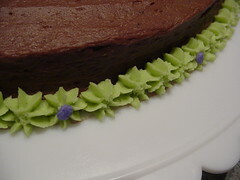 You can’t see it with it decorated, but in the pictures below it is visible that the cake is chocolate. 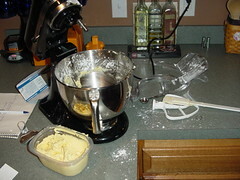 I knew if I was going to make a cake and if there was any chance of it being eaten, it would have to be chocolate. The cake is an all natural, dairy-free, egg-free, nut-free, chocolate cake by Cherrybrook Kitchen. 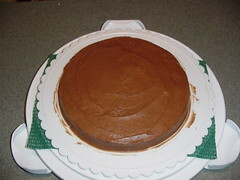 Instead of the 1/2 cup of vegetable oil they said to use in the baking of the cake, I did a little research and substituted 1/4 cup applesauce and 1 Tbsp of Canola oil in place of it. I also separated the batter into two 9″ round pans to make the cake last for 2 classes and when I did that, I reduced the time in the oven from 25 minutes to 15 minutes (the lowest recommended baking time for cupcakes) and it all worked out absolutely beautifully. It baked up nicely and tastes wonderful. 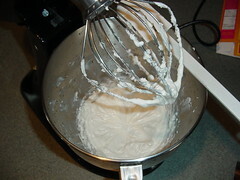 Below are some pictures I want to share some of the process of the making the icing to the icing of the cake. And finally, it was put into its carrier for safe transport – the cake made it to and from class with no harm. Below is just a little something extra from the class. 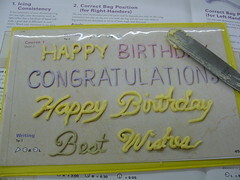 One of our exercises was to learn to write with icing with various tips. Even though it was tracing, it was still really difficult, but once I got the hang of it, it wasn’t too bad. Can’t wait until this tuesday, next is flowers. Not so sure about this part, but it will be fun to see everyone’s creations. 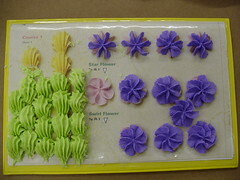 Last week Carla, Meghan, and I went to our first class of The Wilton Method of Cake Decorating: Course 1 at Michael’s Craft Store. I was hesitant at first, not knowing how much I would have to spend and how much I would get out of the class. I thought that I should check it out thought since I would get to spend some quality time with friends and get to learn something new. After a few questions were asked of the helpful Michael’s employees, I decided to join the class. Luckily, the cost of the class was 50% off for the month of September, so the class was only $17.50 and that is for all 4 lessons (1 class per week for 4 weeks) and that included the workbook for Course 1. The way our class worked was we didn’t need any tools for the first class, we just watched the teacher, asked questions, and took notes for this class and what we needed for the next class. The last part of the class the first night involved the teacher taking us to the section of Michael’s where the cake decorating items are located. She showed us various tools needed and what was optional and then let us paruse at our leisure. There was no obligation to buy at Michael’s, however, after some consideration, I chose to buy my items there and save some time knowing that I would be buying nice items that would last me a while. 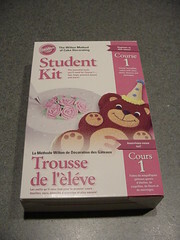 If you don’t have any cake decorating tools to begin with, like I did, there is a bit of a start-up cost along with the cost of the class. 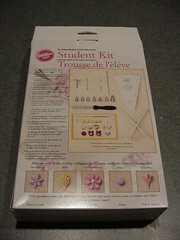 As for the necessary tools, they have a Course 1 Student Kit that includes the “essential tools” for this class like decorator bags and tips, couplers, a spatula, a practice board, and a few other items for about $25. 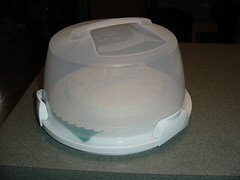 In addition, I chose to buy a cake carrier (since we would have to bring a cake to class each night and I didn’t have any safe way of getting a cake to class) for $15 and a cake turntable (to help with not having to turn the cake constantly and allowing for more even icing) for $10. 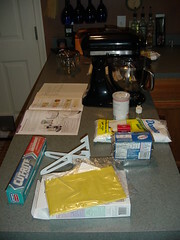 There are other essentials needed for the class like what you will need to bake a cake and ice it each week along with the practice icing that needs to be made which is different for each class session. Some the items for this include: meringue powder, shortening, confectioners’ sugar, flavor, icing color, and cake ingredients that you prefer. Also, there are other things for the class you will need which are small derby clown heads, waxed paper, and piping gel (but we didn’t need piping gel in our class, yet). A few of the non-essential items that could be helpful depending on what you want to accomplish are a cake leveler, extra couplers, extra decorator bags and other tips for creativity along with so many more things. The cost can really add up quick but to get the necessary extras, it can be between $20-40 depending on what you buy and where you buy it. So far, I have attended 2 classes and have really enjoyed them. It is still a little girlee for me at times, but it really is a lot of fun and I have learned to really appreciate the art of cake decorating and why professionally decorated cakes cost so much – it really takes skill and patience to get it just right. 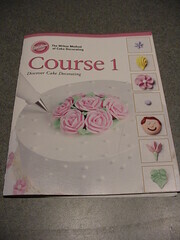 The class is perfect for anyone wanting to learn about decorating cakes – to be a professional or for fun. I think this class is perfect for those who want to have fun and be able to make and decorate cakes for family and friends’ birthdays and the like.